As part of the preparation to 4P in January, I will be doing a series of posts aimed towards new designers about how to approach playtesting your first game. But this advice is good any time of year! So you have a game you’re working on. You know better than to go through the purgatory of constantly refining the idea without actually playing it, so you’ve made a playable version. Maybe it even looks kind of good. You show it to your friends. They play it. They say they like it, but you can tell they don’t. You make some changes and ask your friends a couple of weeks later if they’d like to play it. They hem and haw, but decide to play something else. What do you do? Where can you go? The toughest thing about being a new designer is how hard it is to find a good, consistent playtest group. Solo playtesting can help… a bit. It’s not a replacement for live testing, and I don’t count a solo playtest as one of the four playtests for 4P. But solo playtesting can help you spot big issues early, so when you bring your game to your playtesters, it’s a little further along than it was before. The key for solo playtesting is that you’re not looking for fine issues or tiny mechanical imbalances. You’re answering for broad proof-of-concept questions. Is only part of this game fun? What mechanisms should I emphasize? What mechanisms should I remove? Is the game’s economy too loose or too tight? Are there enough interesting decisions for players to make? Don’t expect to make it through a full game. A few rounds should give you an idea of what’s going on. Take notes. Rapid iteration is also important here. Don’t spend a lot of time on art or bits, as you are the only person who will ever see this version of the game. 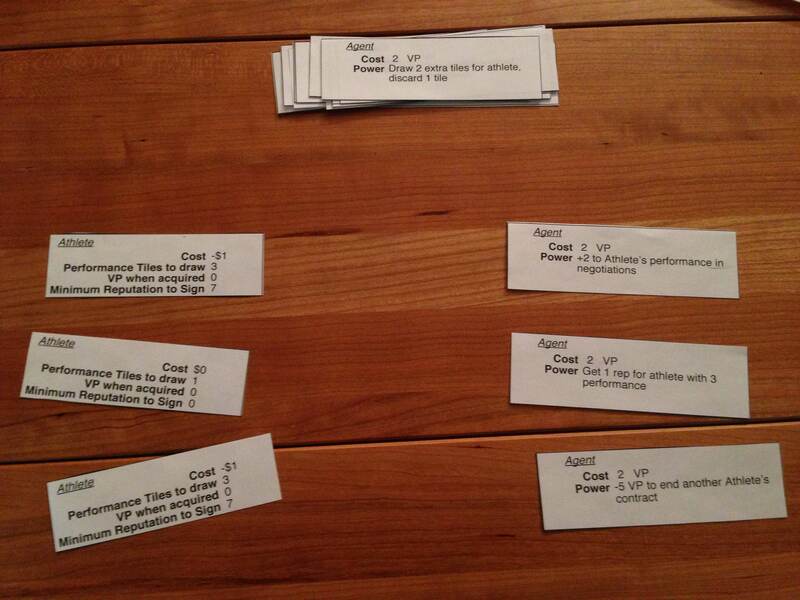 I print my solo playtesting bits on ordinary 8.5″x11″ paper, not even cardstock. I don’t care about card or tile opacity. I just want as few barriers as possible when I print a new version of the game. As you can probably tell, the game is about sports agents signing mega-athletes. Right now, it looks terrible, and I don’t care; I’m not going to play this version at 4P! Instead, I’m just looking at the game from a 30,000 foot perspective and trying to figure out what works. I’ve done a couple of solo playtests so far. Each test was about 20 minutes; only a couple of rounds each time, while I worked on those basic questions. I found that I had put in a few too many mechanisms. I had an action for players to get agents, an action for players to get athletes, an action for players to submit a bid to teams, and an action to use an agent’s power. I found that the heart of the game is really in getting teams to sign your athletes. In fact, the interesting thing will be that may become a backwards kind of auction game; instead of the game determining the resources that the players will bid on, the players will determine the resources that the game will bid on! So my next version of the solo game will temporarily drop a bunch of mechanisms, including the agents and their powers. I will focus on the backwards auction (noitcua?) and see if I can make that interesting. If that sticks, then I might restore agents, but I’ll have a better idea of what kinds of powers I can give them. I’m giving you this information not to crow about my game (which is going to change a bunch more times over the next couple weeks, and then again during 4P), but to tell you about where you should expect to be if you’re participating in 4P. If you’re still at the idea stage, you’ll want to start getting your ideas down and play around with them. You’ll want at least a couple of solo tests before testing with other people. It’s funny how the term “play” here works, because that’s what you’re really doing here. You’re in a kind of designer’s Calvinball, where you’re going to be inventing rules out of thin air. Don’t be afraid to make bold moves. Cut out entire swaths of game. This is the time when it’s easiest to make mass changes, because the game is completely malleable. Don’t get too attached to your idea; be flexible and ready to react if the game seems to want to take a different direction. If you do a good amount of solo testing, that means you’ll be bringing a version of the game that’s a little more sound for others to try. That’s not to say that it won’t change after solo testing; far from it! But you’ll be in a better position to know what your game is about, and you will have an idea of what your game can and can’t do. I recommend that every designer solo playtests his game, usually more than once, before anyone else plays. It’s the first stage of playtesting. (see Chapter 6, Section B in my book “Game Design: How to Create Video and Tabletop Games, Start to Finish”, or http://pulsiphergamedesign.blogspot.com/2007/10/playtesting-is-sovereign.html.) It’s easier to do in single-player video games, but even in multiplayer tabletop games the designer can fake it. And I think you should play it all the way through: why only find out some of the bigger flaws before you inflict the game on other people, try to find all of the obvious ones. Also, if you can’t play it all the way through, are other playtesters going to be able to play it through? By the time other people play the game, it ought to at least work, even if it isn’t much of a game. Great advice, thanks. Any advice for games where knowledge of the game significantly changes the play experience the second or third time around? I have a hard time turning off my knowledge of all the minute details to simulate a first-timer’s play experience. Try to have each player take a slightly different route in each game. That might put you in each player’s mindset, and help you “play dumb” about how he/she would react to the other players. Don’t get too worried about some inadvertent knowledge sharing. A solo playtest is more to make broad-strokes judgments than to find subtle balance issues.